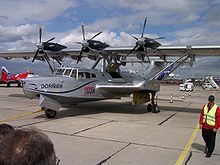 The Dornier Do 24 was designed to meet a Dutch navy requirement for a replacement of the Dornier Wals being used in the Dutch East Indies. It was an all-metal monoplane with a broad-beamed hull and stabilising sponsons. The aircraft was powered by three wing-mounted radial engines. The first two aircraft built were fitted with 447 kW (600 hp) Junkers Jumo 205C diesel engines. The next two had 652 kW (875 hp) Wright R-1820-F52 Cyclones, this was to meet a Dutch requirement to use the same engines as the Martin 139. The third aircraft (with Cyclone engines) was the first to fly on 3 July 1937. Six Dutch aircraft (designated Do 24K-1) were built in Germany, followed by a further aircraft built under licence by Aviolanda in the Netherlands (designated Do 24K-2). Only 25 aircraft had been built on the Aviolanda assembly line before the German occupation. The Luftwaffe were interested in the completed and partially completed aircraft. The Dutch production line continued to produce aircraft under German control. 11 airframes were completed with Dutch-bought Wright Cyclone engines, but later models used the BMW Bramo 323R-2. A further 159 Do 24s were built in the Netherlands during the occupation, most under the designation Do 24T-1. Another production line for the Do 24 was established in Sartrouville, France, during the German occupation. This line was operated by SNCA and was able to produce another 48 Do 24s. After the liberation, this facility produced a further 40 Do 24s, which served in the French Navy until 1952. 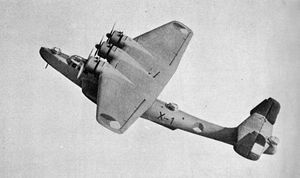 37 Dutch- and German-built Do 24s had been sent to the East Indies by the time of the German occupation of the Netherlands in June 1940. Until the outbreak of war, these aircraft would have flown the tri-color roundel. Later, to avoid confusion with British or French roundels, Dutch aircraft flew a black-bordered orange triangle insignia. After the Japanese invasion, six surviving Do 24s were transferred to the Royal Australian Air Force in February 1942. They served in RAAF through most of 1944 as transports in New Guinea, making the Do 24 one of the few aircraft serving operationally on both sides during World War II. During the war, a German Do 24 made a forced landing in neutral Sweden, was impounded and paid for, and remained in Swedish service until 1952. In 1944, 12 Dutch-built Do 24s were delivered to Spain with the understanding that they would assist downed airmen of both sides. After the war, a few French-built Do 24s also found their way to Spain. Spanish Do 24s were operational at least until 1967, and possibly later. In 1971, one of the last flying Spanish Do 24s was returned to the Dornier facility on Lake Constance for permanent display. Swiss production &amp; Dutch license production aircraft, 36 built. Dutch licence production powered by three 746 kW (1,000 hp) Wright R-1820-G102 engines. 1 built. Dutch-built Do 24K-2s completed for Luftwaffe for air-sea rescue powered by three 746 kW (1,000 hp) Wright R-1820-G102 engines, 11 conversions. Dutch production for the Lutwaffe powered by three BMW Bramo 323R-2 engines, 159 built (including T-2 and T-3). Do 24T-1 with minor changes. Post-war restoration with three Pratt &amp; Whitney Canada PT6A-45 turboprop engines, one converted. One Do 24T modified in 1944 with a boundary-layer control system. A Do 24T-3 is on is on display at the Dutch Air Force Museum, Soesterberg, The Netherlands painted to represent an aircraft of the Marine Luchtvaartdienst - Dutch Naval Air Force. The restoration quality was such that the aircraft could be made readily and quickly airworthy. 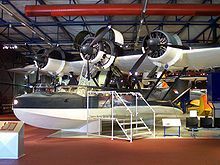 A Do 24T-3 is on display at the Flugwerft Schleix�heim branch of the Deutsches Museum in Oberschleix�heim. A Do 24T-3 is on display at the Museo del Aire, Cuatro Vientos, Madrid, Spain. Picture - Dornier Do 24 forward fuselage remnant with sponson on display at the Technikmuseum Speyer, recovered from Lake Muritz.